Invoking journalism history, New York state’s highest court has ruled that under New York’s state constitution and the state’s version of a “shield law,” a journalist cannot be forced to divulge the identity of a confidential source — even if another U.S. state is trying to extract the information. The ruling, issued Tuesday, was a major victory for press freedom, and not just in New York. But it will have its greatest impact in New York, where so much of the news media operate, because now the highest court in that state has ruled that New York’s own laws grant complete immunity to journalists from any attempts to force them to reveal their sources. Since that court is the ultimate interpreter of the New York state constitution, it is a landmark. It remains to be seen if a New York journalist can use this new ruling as a shield against federal prosecutors. Federal courts are not obligated to follow the New York state court ruling, of course, but any person who gains more rights under a state constitution or law does not forfeit those rights just because federal law has not caught up. The U.S. Constitution and federal laws establish legal minimums that must be afforded to all Americans, but they do not establish maximums. When it comes to our rights, federal law is a floor, not a ceiling. Many, many courts would rule against the journalist in these circumstances. Judges normally sympathize with their fellow judges and see things their way. Judges normally do not like to see anyone violate their rulings and get away with it. Judges like the idea that what they say, goes. All of which makes this ruling even more remarkable. It was a win-win: the court expanded legal protections for reporters, and it relied in part on a famous case involving an 18th-century partisan journalist to do so. New York has a long tradition, with roots dating back to the colonial era, of providing the utmost protection of freedom of the press. Our recognition of the importance of safeguarding those who provide information as part of the newsgathering function can be traced to the case of “John Peter Zenger who . . . was prosecuted for publishing articles critical of the New York colonial Governor after he refused to disclose his source” (Matter of Beach v Shanley, 62 NY2d 241, 255  [Wachtler concurrence]). 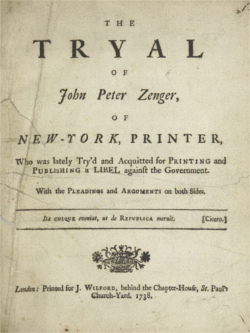 A jury comprised of colonial New Yorkers refused to convict Zenger — an action widely viewed as one of the first instances when the connection between the protection of anonymous sources and the maintenance of a free press was recognized in the new world. In acknowledging the critical role that the press would play in our democratic society, New York became a hospitable environment for journalists and other purveyors of the written word, leading the burgeoning publishing industry to establish a home in our state during the early years of our nation’s history. That is an important point: New York did indeed become the nation’s media capital. I doubt that the New York State Constitution was much of a causal factor (compared to all the economic ones), but the fact that the industry is now centered in New York City means that many, many journalists enjoy the favored status granted by this new ruling. And the ruling holds that a New York-based journalist is protected by New York’s constitution even when he or she roams into another state or online to do reporting. What remains to be seen is what might happen when a New York-based journalist attempts to use the new ruling in the Winter case against a federal prosecutor who comes around with a subpoena seeking to force a journalist to name a confidential source in a federal investigation or trial. Judge Graffeo wrote that the protections offered to journalists in New York are ancient, robust, and multiply determined. press” (NY Const, art I, § 8). In her reading, that language from 1831 constitutes a shield for journalists all by itself, saying it is more expansive than even the First Amendment to the U.S. Constitution and thus affords more protections to New Yorkers than other Americans enjoy under the First Amendment alone. no professional journalist or newscaster . . . So, Judge Graffeo concludes, journalists in New York are protected by common law, constitutional law, and statutory law. Now, how hard was that? Why do so many judges fail to understand this reasoning? The ruling holds that all these sources of protection for journalists combine to provide evidence of a clear “public policy” in New York state to encourage the practice of journalism within its borders. 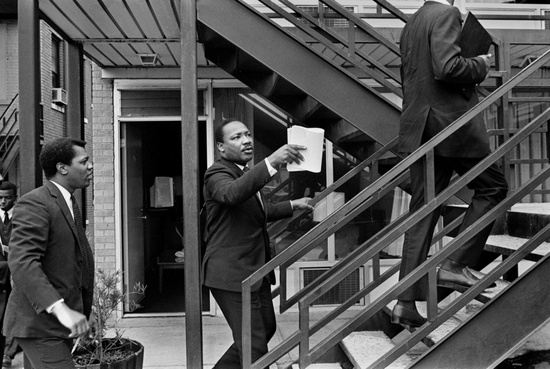 Caldwell, left, with MLK in Memphis, 1968. It’s thrilling to read a judicial opinion written by a judge who actually understands the meaning of a free press and appreciates its value to society. It’s rare — and therefore, I suppose, all the more thrilling. Finally, a hat-tip to the judge, Victoria Graffeo, the former solicitor general for the state of New York who was appointed to the Court of Appeals by Republican Gov. George Pataki to a 14-year term in 2000. No liberal, Graffeo was expected to be a moderate conservative voice on that important bench. Labels aside, she gets credit for getting the point.